Yay! We’re Almost as Rich as We Were in 1998! But, and I don’t think Jason Furman would disagree, this is not particularly strong evidence that everything is rosy, or that “America is already great,” as some would have it. As many people have pointed out, median household income in 2015 was only back to its 1998 level. Actually, when you take into account a methodological change in 2013, it’s still 5% below its 1999 peak. 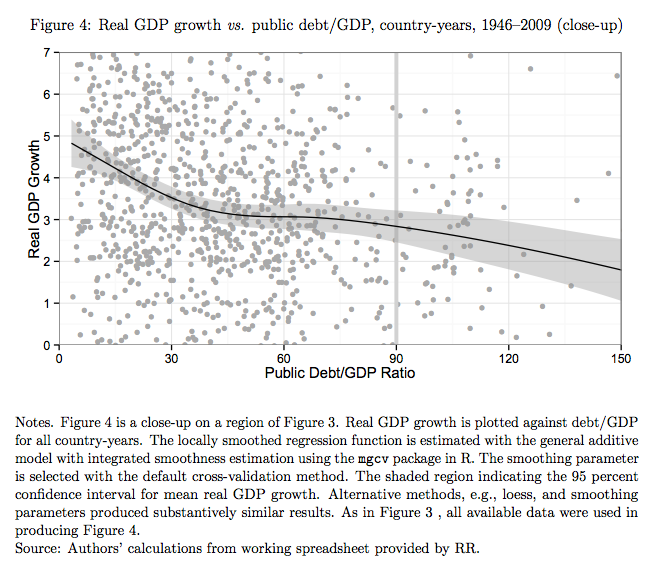 One more post on Reinhart-Rogoff, following one on Excel and one on interpretation of results. Are Reinhart and Rogoff Right Anyway? How Long Can We Finance the Debt? Everyone should know by now that the Treasury Department can borrow money at historically low rates. That is a major reason why some very smart economists think that the federal government should borrow more money in the short term (i.e., this year and next) and use that money to boost economic growth. In the medium term (say, the next decade), however, the big question is how long we will be able to finance new government borrowing at such low rates. Today’s low rates are a product of several factors. One is certainly the slow rate of economic growth, in particular the depressed housing market, which has reduced demand for credit. But another factor is the Federal Reserve’s aggressive moves to keep long-term interest rates down; another is foreign central banks’ appetite for Treasuries.